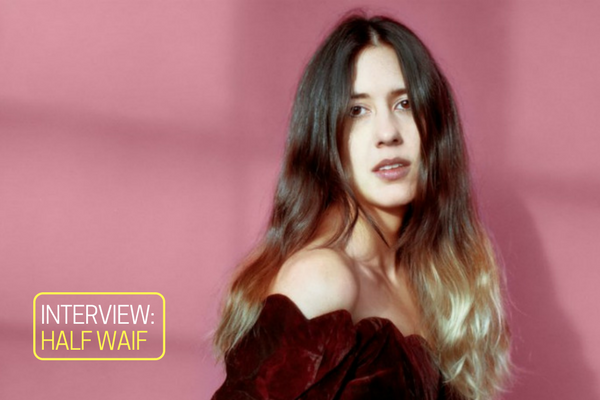 KGNU's Indra Raj chats with Nandi Rock Plunkett of the band Half Waif, just after the release of 'Lavender' in April 2018. Indra Raj: Thanks so much for chatting with me. I know you're very busy right now, in the middle of a tour for your recent release "Lavender." Nandi Rose Plunkett: That’s right. We started the tour last weekend. We're here in Montreal. We played here last night and then we got a day off here today, which has been really fun. Indra: It must be really nice up there in Montreal right now. Nandi: Well, it’s pretty grey and rainy, but I did get some croissants from my favorite bakery this morning, so that pretty much made my day. Indra: That makes it all worth it. It's great to be talking with you, especially because you're going to be in Denver this Sunday on May 6th at the Larimer Lounge, which we are all very excited about. Nandi: Yes, we are so excited. Indra: Have you played in Denver before? Nandi: Yeah, we have played in Denver a couple times. I think we did play at Larimer Lounge a couple years ago, but we always love coming through so, I'm excited. Indra: That will be great, and your new release “Lavender” is so beautiful, such a wonderful album. Is this the first time you’ve performed these songs for live audiences? Nandi: We've played a couple of them. We started performing some of the tracks earlier this year when we were in Europe with Iron & Wine. We were starting to test the waters, but then we got the whole album together right before this tour, so we're five shows in and we've been playing the whole album every night. It's an incredible feeling, but it's also very ambitious. We were wondering how we were gonna go about playing these songs live because obviously there are a lot of layers and sounds, so we're really pushing ourselves to the full extent of our capabilities on all of our instruments and it's a big challenge and an ambitious project, but I think we're doing it. Indra: So much of the record is synthesizers and drum machines and stuff like that. How did you take those songs you wrote from a recorded form to a live stage? Nandi: We sort of take a different approach to each song which is how we recorded the album. Something I really like about our process, there isn't one way that we go about things. We really try to honor the song and what it calls for, so when we were working on the record, sometimes it would be me and my band mates Zach and Aiden working on the track together, going over drum sounds, or playing synth together and coming up with the arrangement. Sometimes I would work on it a little more on my own and then bring it to them and bounce ideas off of them, but it was a really varied approach that we took to making the record and I think that it also reflected in the way that we are approaching it live. Some of the songs, we're using some backing tracks to get as much sound as we can but also, I'm playing two keyboards and I have a vocal pedal and our drummer on tour who does live drums, but also has all these drum triggers, and he's playing keyboard and Aiden is playing bass and guitar. So, we're trying to cover as much ground as we can as a trio, and yeah, we're making a lot of sound for three people. Indra: I'm curious to learn a little bit about your history with music. When did you start playing music and how has it evolved for you in your life? Nandi: I feel like music is just in a part of who I am since the very beginning. People always say I came out singing. I heard my mom say that about me and I think it applies in this case. I was making up songs from as far back as I can remember, and when I was six years old I started taking piano lessons, and I was just writing my own songs on the piano. Eventually, my piano teacher was like, I don't think you really want to be playing these pieces. I think you want to write your own music. As a young kid, I wasn't really practicing my scales and what not, so eventually I transitioned into doing my own thing and called myself a songwriter formally in middle school. Around age 14, I was like, "this is who I am, and this is what I'm doing." And I've been a songwriter ever since, I guess. I was taking voice lessons around that time, and I studied classical singing in college as well as composition and I had some bands in college as well. Really, I was just trying to explore as many different kinds of music as I could. That was both in the classical realm and the electronic realm and just trying to amass as much musical vocabulary as I could, and looking back on my trajectory I can kind of see different bits and pieces of my musical path making their way into the music I write now, which feels really varied and pulls from a lot of different kinds of sounds and sources of inspiration. Indra: I was looking at your Bandcamp page, and the short artist bio for you is a quote about your music refers to Celtic melodies and devotional songs in Hinduism, so I'm assuming this references your cultural background because I believe your father is of Irish descent and your mother is Indian descent, is that right? Indra: Do you embrace these ways of categorizing your music? Nandi: I’m certainly not going into writing like "I'm now going to channel my Indian side," or "now I'm going to bring in an Irish accent to my voice.” It's not a conscious thing. That's the bedrock of who I am and my upbringing and it was a very musical household. My dad is a musician - he plays a lot of traditional celtic instruments. He kind of schooled me in more of the folk tradition. And on my mom’s side, we had a guru growing up and we would sing songs for him and about him and you know, those things might now inform who I am today consciously but they're absolutely part of what makes me a musician and what kinds of sounds made me who I am today. I also feel very connected to my heritage on both sides. I always have. I think I can be traced back to growing up as a kid in a very homogenous white town and wanting to find how I stood out. I've been asked before if people ever made fun of me or anything for being different, and I really embraced the fact that I was a little bit different. I wrote a musical about the Taj Mahal in fourth grade, and I had my mom come in and we performed it. For me, it was a way to find out who I was at an early age. I am very grateful to have that background and to have that connection to these places that feel kind of like my homeland for me. That was sort of the concept for Half Waif. A “waif” is like somebody that doesn't have a home. But, for me, it wasn't like I didn't have a home; it was just that I had so many that sometimes it can feel like there’s a more general disconnect where I don’t know where to put my heart. I don’t know where my home is because I feel connected to so many places. Indra: That's really beautiful. So, I read in an interview that now that you are twenty-nine that you have more to say that maybe you did during your early twenties. Can you tell me a little more about that? Nandi: It’s a thing you always hear about aging, which is like, you get more comfortable with yourself, you kind of learn to get to know yourself better in ways. I find aging to be such an interesting process. I always said when I was younger I would never resist it and when I start going grey, I’m gonna go grey and I just wanna embrace my age. But, now there are elements of aging and suddenly being almost thirty and seeing my hair turn silver and still feel like a kid in my heart and my body in certain ways, and also looking in the mirror and being like "Oh no, woah. You're a lot older than what you thought in your head." I think about it a lot. I'm thinking about being a woman in this industry and people being like "this is your debut album," and it’s like, no, we've been doing this for a while. The empowering side of being older is that I'm just more ready for all of this right now. I think that I am a late bloomer in a a lot of ways. Things have happened a lot slower for me, certainly in relationships and now in the way that I've built up my musical voice. It's taken me some time and I think it’s happening exactly when it should be, which is that I have more to say. I have more experiences. I have better ideas on how I want to express myself lyrically and musically, and I’m better prepared for people to be listening to the music and for things to be happening in my career because i'm a little bit older and I have this foundation of this relationship that I'm in, and the friendships that I've built, and the homes that I've made. Of course, I'm still learning all the time and I hope that I continue to grow and evolve and be questioning and looking for answers and doing that through writing music. In terms of where I am at now, I'm really trying to focus on the positive side of aging and honor myself for where I am in my process. Indra: You mentioned being a woman in the industry and I think right now there’s a lot of movement in advocacy around women rights across all sectors, but it's still early to tell what the real impact has been and will be in various industries. I'm wondering what it's like to be a relatively young woman in the indie scene for the last decade or if you've seen any changes with the recent women's movements that are happening right now. Nandi: I think the biggest changes are just the conversations that are happening. That seems like a simple thing. That is absolutely the first major step to big change - is for it to enter common place conversation. I wrote this piece last year for the Esquire about "being the girl in the band," about my experiences playing in a band of all men. I've had a lot of men in my life saying to me that they had no idea I experienced that, and that was so shocking to me because I was like this is the only time I'm writing about it on this website but this happens all the time. This is the one time I'm speaking up about it, but I’m always speaking up about because I'm always so frustrated and tired of seeing tweets aimed at me saying "Why are you playing music, why are you in this band? They'd be better off without you." And it's just stupid things like trolling. But it’s trolling and getting at the heart of an issue that is very real, and that was what really what triggered me was that men felt that they could say these things and felt okay to be perpetuating the marginalization of women. It absolutely needs to stop. It can't be a comment that you can make to women. It's deeply devastating and it has been for generations, forever. So,I think the fact that people say that they didn't know this happened, of course there are so many men who don’t talk to women like this and don’t perpetuate sexist work environments. I mean, that goes without saying. I think for these men who are in positions where they can start turning things around, it's important for them to recognize how important and pervasive it is and open their eyes to ways their playing into the patriarchal system, and I think that I feel good that these conversations are happening. As tiring and triggering as a lot of them can be, at least it is happening now on a much wider scale and I hope that will just lead to greater awareness to all sectors and eventually to concrete change. Indra: The band you were talking about was Pinegrove. There were six of you? Nandi: Yeah, there were six of us. Indra: Okay, and you were the only woman. So, now you're the main songwriter or the head of a trio, and you’re the only woman again, but it’s a different position in the band. How has that felt? Nandi: Yea, it is a different position. I don't think... I mean the comments that I was getting from being in Pinegrove were like aimed at me being one of the members and basically me being disposable. You can't say that to me now because they're my songs and I'm lead singer. That has changed in that regard. What's really been so incredibly gratifying for me with this project has been the young women I speak to after performances who expressed to me that they are songwriters or they want to get into it. They're musicians, and they're just starting out and it's a great feeling to have someone look at you and say "thank you for being up there and doing what you do." There’s a lot about this lifestyle that's tiring and exhausting and challenging, but that makes everything worth it when you connect to a person that way, especially a young woman who was like me when I was first starting out and seeing someone do something you want to do gives you that push. I'm stunned that I can play that role in someone’s life. Learn more about Nandi Rose Plunkett and Half Waif at www.half-waif.com.